By GreenEyedLillies on June 2nd, 2009 . Filed under: Baby, Clothing, Giveaways, Kids . Lola’s Girl is giving away the Too Sweet Cupcakes Summer Dress to one lucky winner! A sweet dress to enjoy the summer days in. Made with Robert Kaufman “too sweet” fabric. 100% cotton= 100% comfortable. Available in size 18-24 months. To enter this giveaway please visit Lola’s Girl and then come back to ATC and leave a comment to this post telling us about what your favorite item that you saw on her site was. It’s that easy! This giveaway is open to everyone worldwide. One entry per person! A winner will be chosen via random.org on Friday June 5th. I would like to thank Lola’s Girl for creating and donating the gorgeous prize for this giveaway. love love love lola’s girl clothes! does she have them in big people sizes? cute, simple, great colors, cooling fabrics. Cupcake dress, ftw! That’s my fav, and I have a beautiful little girl who would LOVE to wear it! I have a 24 month old that ADORES cupcakes!! and my fav item is the cute green owl skirt. My favorite was the Raspberry Twirl Dress on her site…All of them were very cute! I also LOVE the Cupcake dress! I like the bib kerchiefs. Very cute idea! I love, LOVE the cupcake dress, perfect for my daughter’s upcoming cupcake birthday party! What a great dress!! It’s perfect for any little girl!! I really love the cupcake dress, but the raspberry smoothie dress is super cute too. My lil baby girl would look adorable in either. I hope I win! My favorite item in the shop (besides the adorable cupcake dress) is the “fresh flowers twirl skirt” -cute! I like the strawberry limeade sweet summer dress!! I like all of her summer dresses, but the too sweet cupcake one and the raspberry smoothie are my favorites! All Things Cupcake - #1 Cupcake Site, Updated Daily - All Things Cupcake Related. Birthday Ideas, Vegan Cupcakes, Cupcake Accessories, Cupcake Artwork, Cupcake Tattoos & More! » Blog Archive » June Giveaways!!! Oh wow! That cupcake number just stole my heart! I have a precious little one that would just look too cute in it. Thanks for the awesome chance to win it! That Strawberry Limeade dress is adorable too. I like the bib kerchief’s. But my favorite is still the cupcake drees. So cute! Ofcourse I love the cupcake twirl skirt! How fun would that be to wear…for little girls or us grown up girls ;0)! twirl, twirl, twirl, we love twirly skirts of any kind. I LOVE the cupcake dress of course…all her designs are very cute though! I love the cupcake dress the most but all of her fabrics are so adorable. I think my second favorite would have to be the strawberry limeade dress. That print is just cute! strawberry limeade sweet summer dress is my fave!!!!! Of course the cupcake dress is my favorite! We love EVERYTHING with cupcakes or should I say “ALL THINGS CUPCAKE”!!! I absolultley love the “Raspberry Smoothie DIY dress kit”. That is such a cute dress and great idea to send it out for us to make ourselves. I am just a beginner at sewing and would love to make some cute dresses for my 15 month old. I love the cupcake dress the most!! Cute fabrics! I know just the little girl to give this adorable dress to! How sweet it is! I love the cupcakes dress and skirt of course and the fresh flowers skirt is very nice too! I have a daughter who I call “cakes” aka “Addicakes” that would look adorable in the dress. The dresses are so simple and cute! The cupcake dress is soo cute & the brown ribbons are a great accent to the dress – My daughter would look cute with matching ribbons in her hair! Love the strawberry limeade sweet summer dress too! green & pink are always cute together! I love that cupcake dress! My little girl would look adorable in it! 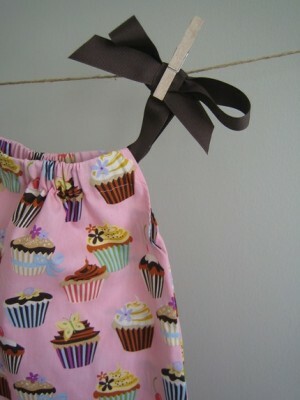 My absolute favorite item at Lola’s Girl is the cupcake skirt. Would love to see that cute little skirt in adult sizes too. I love the little green skirt with the owl on it! I love the cupcake skirt. Can just imagine my little girl twirling around in it. I LOVE the Raspberry Smoothie Sundress. It would look so cute on my daughter! Thanks to you both for the fabulous giveaway! OF COURSE my favorite was the too sweet cupcakes summer dress, but I also LOVED the raspberry smoothie and the green one, forgot what it was called, but had an owl on it, figgen adorable! Even if I don’t win this, my little girl is getting something from lola’s girl! So glad I found it!! I love the cupcake skirt too! Wish it was adult size! So cute. I love all the dresses with the bows for shoulder straps. I love the Raspberry Smoothie Sweet Summer Dress. Its adorable! My little 2 1/2 year old would look super cute in anything from her shop! The twirl skirt with the cupcake print is gorgeous! Lots of cute stuff, but as a cupcake lover I would have to stay the dress or the cupcake skirt are my favs. I love her strawberry limeade dress..the bright pink ties are adorable! I really love the cupcake summer dress! the twirl skirts are too cuteeee!! LOVE everything!! i can’t choose just one thing!! OMG I love the strawberry limeade dress. I know that my tan little baybay would look absolutely delicious in that dress. I love love love it. I want a tube tob for me that looks like that. Then we could match!!!! Random.org chose your comment number! The dresses are so simple and cute! Every girl do like it.